We had quite a time yesterday with the birthday festivities. It's not all that often that a boy chooses to go to the local Japanese steak house for his 5th birthday. Then again, I don't guess I would say that our boy is typical or ordinary. I am certain that the other people at the table with us got much more of a show than they had bargained for. It was, however, a time full of laughs and ended with fuller bellies. 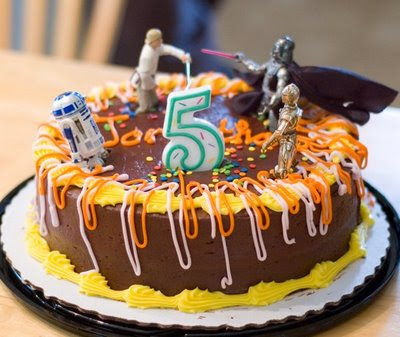 We even ended up with a cake that met the specifications of the birthday boy--chocolate inside, chocolate icing, and it had to have Luke Skywalker fighting Darth Vader. The Luke Skywalker was the difficult part, but Jonathan was excited that Nana was able to find some figures and threw in CP30 and R2-D2 for good measure. 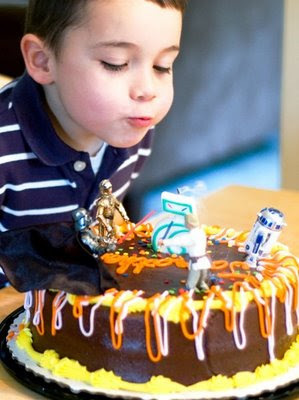 Justin said he felt like he had come full circle, and there is no doubt whose child picked out a cake like that.